A decade ago, transit of goods in Central America suffered from lack of coordination of border agencies, cumbersome and slow Customs and administrative procedures, and limited use of information technologies. More precisely, exporters with shipments in transit had to clear Customs at each side of countries’ bilateral borders and sequentially submit multiple paper documents to the various intervening agencies, including printed copies of international transit declarations, country-specific sanitary and phytosanitary certificates, and migration arrival and departure cards. In response to this situation and with the support of the Inter-American Development Bank (IDB), Central American countries adopted the TIM, an electronic transit system to manage and control the movement of goods in transit that is partially based on the European Union’s New Computerised Transit System (NCTS). Cooperation – TIM improves cooperation between the different agencies operating at border crossings in the Mesoamerican region, both within and across countries. The new electronic transit system reduced trade costs and facilitated shipment flows in at least three ways. First, instead of repetitive paper-based procedures initiated at the border, firms can now complete a single electronic document – called the Documento Único de Transporte (DUT) in Spanish. As a result, the time and costs of document preparation experienced a substantial reduction. Second, firms can now manage their entire transit procedure via an electronic process. At border crossings, controls on shipments are carried out only at the Customs offices of the exit country under the logic of a “one stop border post.” Transporters interact simultaneously and at the same physical place with all border agencies – Customs, migration, and quarantine – without using printed copies of documents. As a consequence, border crossings have been significantly expedited. Third, the information system introduced with the TIM provides trading and transport companies with real-time data on their shipments. This makes it easier for these firms to control orders and manage their servicing and inventories. The TIM was gradually implemented across trade corridors. For instance, in El Salvador, the TIM was first applied to transit operations originating at internal, “non-border” Customs offices, the Free Trade Zones, and coastal Customs offices, as well as transit operations having specific locations in the neighbouring countries of Guatemala, Honduras and Mexico as a destination. In the second phase, the use of the TIM in El Salvador was extended to manage transit operations with Costa Rica and Panama, as these countries had adopted the system. It was also extended to transit operations whose destinations were additional regions in Guatemala, Honduras and Nicaragua, as these countries had decided to incorporate new trade routes into the list of corridors working with the TIM. While in the third phase, further corridors joined the system throughout 2013, as the TIM was being phased-in in neighbouring countries (See Figure 1). Source: Carballo et al. (2016). Trade corridors that started to operate with the TIM in 2011 are coloured in black, whereas those that started to operate with the TIM in 2012 and 2013 are coloured in red. Believing in the importance of measuring the performance of the new transit system, the IDB conducted an econometric study on the impact of the TIM on cross-border trade. 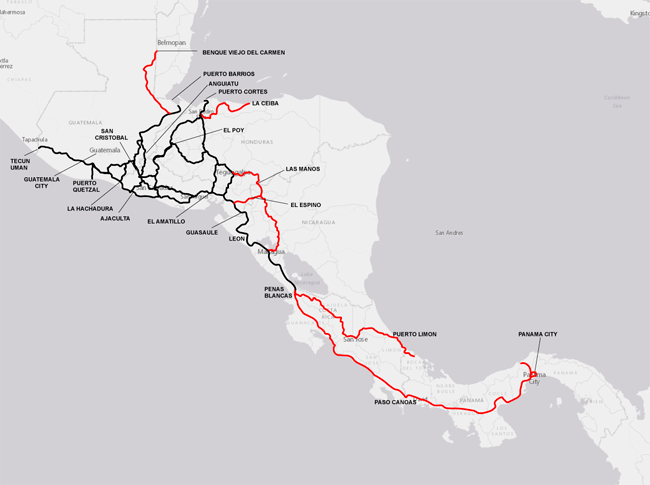 Using a unique data set that consisted of all firms’ export transactions originating in El Salvador over the period 2007 to 2013 and which included information on the transactions processed under the new regional transit system, researchers exploited information on the sequential implementation of the TIM across trade corridors – i.e. origin Customs-specific destination combinations – and carried out “difference-in-differences” estimations to identify its impact on Salvadoran firms’ exports and associated channels. The findings suggested that the average growth rate of exports channelled through this simplified transit regime was 2.7 percentage points higher than their counterparts subject to standard transit procedures. Moreover, the TIM’s positive effect on firms’ exports could mainly be traced back to their increased number of shipments. In terms of the latter, the differential growth rate associated with the TIM has been 1.2 percentage points. Furthermore, estimates reveal that trade impacts have been heterogeneous across products. More specifically, transit facilitation appears to have had larger effects on exports of time-sensitive goods such as those subject to short selling seasons, fast depreciation due to changing tastes, or products for which demand is difficult to predict and shippers need flexibility to be able to respond faster to changing market conditions. Given the additional exports that the TIM allowed for, and its prorated development and implementation costs, including its annual operational costs, calculations indicate that the system had a cost-benefit ratio of at least 40 US dollars per dollar invested in it. Summing up, the results reveal that border administrative requirements and processing are an important obstacle to trade, and that reducing these obstacles has immediate and significant effects on exports.